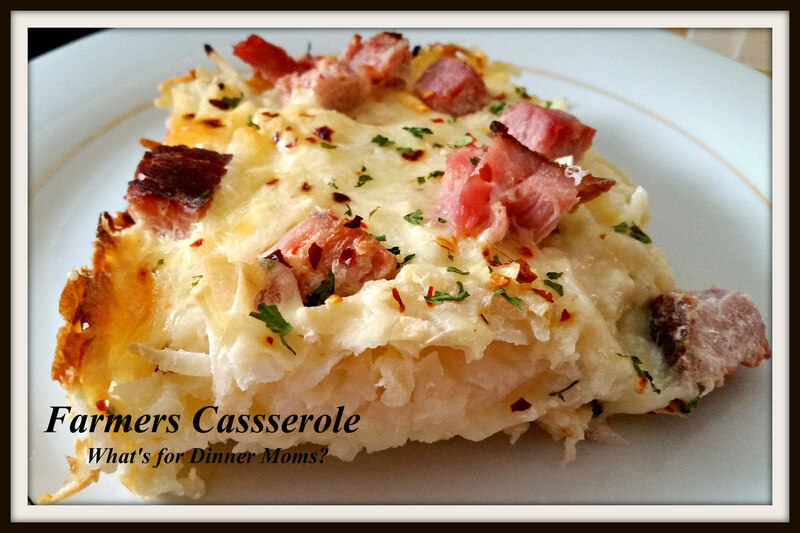 Farmers Casserole – What's for Dinner Moms? Trying to keep these long days free and avoiding the kitchen as much as possible? This casserole is great! You can make it in the morning (or the night before if you want to cook it for breakfast). Let it rest while you are at work and pop it in the oven 55 minutes before you want it on the table. That’s enough time to play a game, make a salad, and set the table! This is one of those casseroles you can make all your own. Change the meat. Change the cheese. Change the spices. Add more vegetables. It is yours to play with. 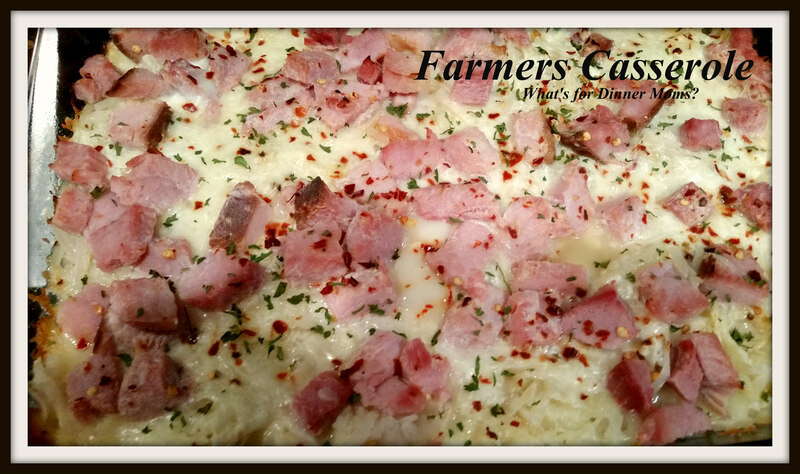 My daughter was already coming up with different combinations – bacon and Swiss, hot Italian sausage with Monterey jack cheese, …. Serve this with a green side salad and a bowl of fruit to make a complete meal. Spray non stick spray in a 13″ x 9″ casserole dish. Layer the potatoes in the bottom of the pan. Over the potatoes sprinkle the ham, cheese, and onion. In a bowl whisk together the eggs, half and half, salt, pepper and red pepper flakes (if desired). Pour mixture over the casserole. Cover and refrigerate for at overnight or at least 8 hours. To Bake: Preheat oven to 350 degrees. Uncover and bake for 40-50 minutes until center has set and edges are browning. It would be good for brunch too! Yum! Thank you! Yes, it would be great for a brunch. Thank you so very much for your very kind words of encouragement! I like the fact that you don’t have to have a lot of complicated and expensive appliances to make this. Thanks! You’re welcome! I try to keep things simple when cooking or find ways around the complicated instructions.